Past research on VR and empathy has shown mixed results. Many virtual reality enthusiasts view it as “the ultimate empathy machine” that can help people relate to each other better than novels, TV shows, or films can. But there is little research examining how exactly the technology can alter people’s attitudes. “About 10 million headsets have been sold in the US over the past two years. So, many people now have access to VR experiences. But we still don’t know much about how VR affects people,” says lead author Fernanda Herrera, a graduate student in the communication department. “This research is an important step in figuring out how much of an effect this technology can have on people’s level of empathy in the long term,” Herrera says. Past research on VR and empathy has shown mixed results and used small sample sizes composed mostly of college students, Herrera says. In addition, previous studies have not examined the long-term effect of VR on empathy—beyond one week. In "Becoming Homeless", a narrator guides participants through several interactive VR scenario that would happen if they lost their jobs. The researchers conducted two two-month-long studies with more than 560 participants, age 15 to 88 and representing at least eight ethnic backgrounds. 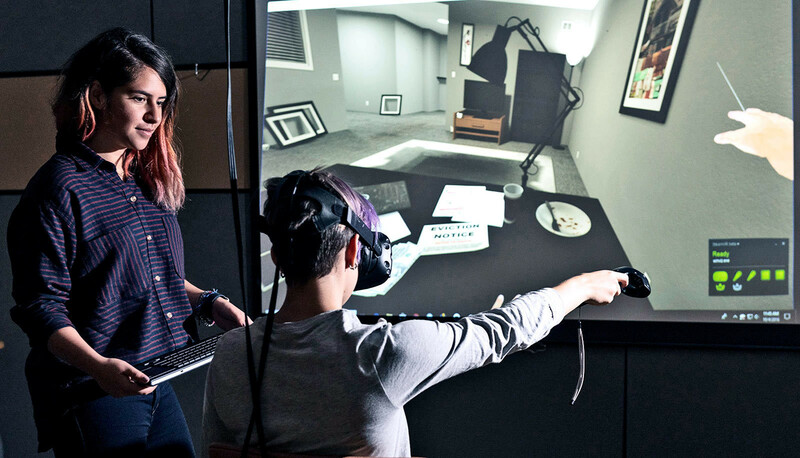 During the research, some participants were shown “Becoming Homeless,” a seven-minute VR experience developed by Stanford’s Virtual Human Interaction Lab. In “Becoming Homeless,” a narrator guides participants through several interactive VR scenarios that would happen if they lost their jobs. In one scene, the participant has to look around an apartment to select items to sell in order to pay the rent. In another scene, the participant finds shelter on a public bus and has to protect their belongings from a stranger trying to steal them. The researchers found that participants who underwent “Becoming Homeless” were more likely to have enduring positive attitudes toward the homeless than people who did other tasks, such as reading a narrative or interacting with a two-dimensional version of the scenario on a desktop computer. The same people were also more likely to sign a petition in support of affordable housing, according to the research. Empathy, the ability to share and understand someone else’s emotions, is a critical part of meaningful social interactions, according to scholars. It has been shown to increase people’s understanding of one another and to motivate positive social behaviors, such as donating, volunteering, or cooperating with others. The studies’ results showed that participants in the “Becoming Homeless” condition were significantly more likely to agree with statements like, “Our society does not do enough to help homeless people.” They were also more likely to say that they personally cared “very much” about the plight of homeless people. The research also showed that their empathetic attitudes toward the homeless endured. “What’s special about this research is that it gives us longitudinal evidence that VR changes attitudes and behaviors of people in a positive way,” Bailenson says. How can we build machines that feel empathy? Not all empathy exercises that introduce perspectives of different groups produce positive effects, the researchers say. For example, previous research has shown that when people are asked to take the perspective of their competitors, they become less empathetic toward them. Similarly, the format of a VR experience also matters when considering how it might alter people’s attitudes, Herrera says. The researchers are working on other studies to figure out the nuances of VR’s effects on people. But for now, Herrera and her team are excited about the evidence that they have gathered in their new study.